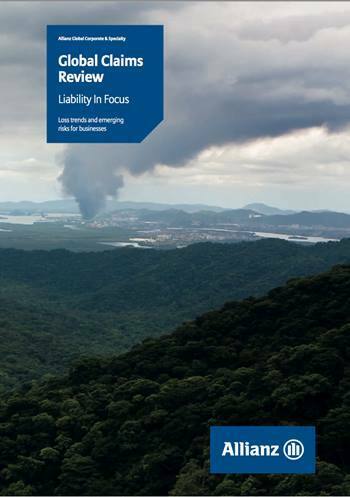 This report focuses on global developments in liability-related insurance claims over the period 2011 to 2016 (September 13), identifying the top causes of loss and other trends across a number of different business sectors, regions and countries. The findings detailed in this report are based on the analysis of 100,073 liability-related insurance claims from 100+ countries (with a total value of more than €8.85bn (US$9.3bn). It is important to note that all claims figures quoted are 100% of the total loss – the data set does not just include the Allianz Global Corporate & Specialty (AGCS) share but also includes the share of other insurers involved in the risk. In addition the data set only examines the liability component of the loss and does not include the hull (property) damage element, when this has also been a feature of a specific incident. Liability losses are pervasive. Claims payments can vary enormously in scale. The top 10 largest claims (very large events) account for approximately a third of the value of all claims analyzed and therefore can significantly impact the value of an average claim for a particular cause of loss. Conversely, liability losses also include a huge number of small payments, which can reduce the average claim value. Therefore we have included both average and median claims values to illustrate the top causes of liability loss. All claims totals are in €. While the losses analyzed are not representative of the industry as a whole, and also reflect risk appetite, they provide a strong indication of the major risks which dominate liability insurance.